The loading dock will be open from 9:00 AM to 7:00 PM on Wednesday, February 13th. Exhibit deliveries should be made to the Calgary TELUS Convention Center North Loading Dock, 705-1st Street S.E. Calgary, Alberta. If you are bringing materials, drive into the loading dock (corner of 1st Street and 7th Avenue) with your booth number ready. St. George representatives will take your materials to your booth. Once your vehicle is unloaded, exit the loading dock and park at one of the parking lots in the area, including the one at the Convention Centre. Please note that parking is at your cost and will not be reimbursed. When you enter the Convention Centre, take the escalator to the second level and follow the signage to the exhibitor entrance, a grey door on the west/left side of the exhibit hall. Entry through the main glass doors is only possible during show hours. 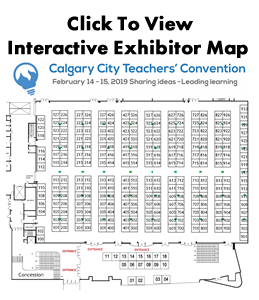 A CCTCA exhibits representative will be present from 9:00 AM - Noon and 1:00 PM - 7:00 PM to direct you to your booth location and give you the WiFi password as well as exhibitor passes. These passes must be shown to security to enter through the exhibitor entrance Thursday and Friday morning between 7:00 and 8:00 AM. If you arrive during normal exhibit hours, you may enter through the main glass doors and no pass is required. Please note that all exhibitors must arrive by 6:30 PM and be set up by 7:00 PM on Wednesday. Should unforeseen circumstances arise where you will not be arriving by 7:00 PM, it is imperative that you notify the CCTCA President immediately at cctcapresident@gmail.com. Exhibitors who have not made contact with the CCTCA President will not be permitted to set-up on Thursday and will be assumed to have abandoned their booth. Exhibit hours are from 8:00 AM to 4:30 PM Thursday, February 14th, and 8:00 AM to 3:30 PM Friday, February 15th. Booths must remain open until 4:30 PM on Thursday and 3:30 PM on Friday. Please do not dismantle your display prior to the prescribed times. Representatives from St. George Show Services will visit each booth during convention to hand out instructions on move-out. In general this process works in the exact reverse of move-in. Exhibitors will pack up their materials and identify all materials with their booth number. At the end of the day, St. George Show Services will move supplies to the loading dock for pick-up. All display materials must be removed from the exhibit floor by 7:00 PM on Friday. Exhibitors wishing to store their materials until the Palliser Teachers' Convention the week after the Calgary City Teachers' Convention may arrange to do so using the St. George Show Services order forms.